What if one of the world's largest car companies told you that, within five years, you could click a button on your phone and a driverless car would pick you up and take you to your destination -- without any human interaction? One thing I do know is that actually riding in one feels extremely boring. 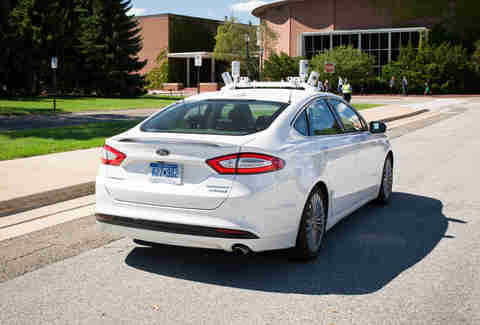 I hopped in the back of one of the autonomous prototypes Ford is currently developing, and even with the most advanced next-gen technology there is, autonomous rides are pretty much business as usual -- a very, very good thing for something in which surprises can be deadly. 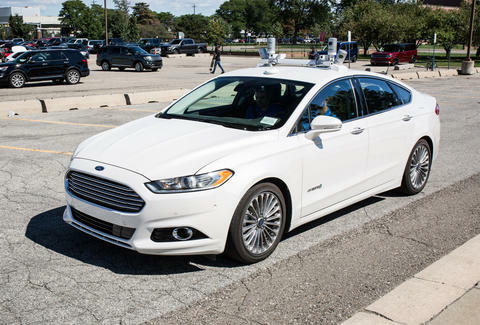 Ford's driverless test mule, which looks like a fairly ordinary Fusion sedan, is retrofitted with high-tech LiDAR hardware and advanced mapping to allow it to function autonomously. Unlike radars and cameras, the LiDAR essentially makes a real-time 3D scan of the terrain, so the car can "see" -- and learn how to interpret -- everything you can see. The spinning "pucks" on the roof do the difficult part, transmitting information to in-car computers and sensing what's in the car's vicinity. In other words, the car can drive without any lane markers, signage, or other cars to follow, which is a phenomenal step up from Tesla's Autopilot, not to mention every semi-autonomous system currently on the road. As impressive as all that technology is, none of it affects the passenger experience, making this one of the most pleasant taxi rides I've ever taken. From my perch behind the passenger seat, it felt like going for a drive in an ordinary sedan, albeit with an unusually safe driver. The ride was smooth and refined, devoid of jerkiness or sudden movements by the car. The Fusion was occasionally flummoxed by stationary objects, like trees that appeared to be in its path -- a sign that there are still some kinks to work out. Having two of Ford's engineers in the front seats while the car drove itself was also pretty anticlimactic. To really get a sense of the thrill (if there is one), I'd need to be in a car alone, just like Jared was. Usually, decisions made behind the wheel rely on either a thorough understanding of motor vehicle code, or basic human morality. In the case of the Fusion's autonomous software, adherence to the rules trumps all. The car drives like my grandma -- exceedingly timidly and politely. Example: the software was designed to recognize crosswalks, slow for them, and wait for pedestrians to possibly cross. As we approached the striped white lines, the Fusion decelerated, noticing a man on his phone standing just left of the crosswalk. For safety's sake, the Fusion didn't budge. Would the man cross? Was he even waiting to cross? After about 30 seconds, the test driver took over. The takeaway: a fleet of these cars would get exactly nowhere in New York City. 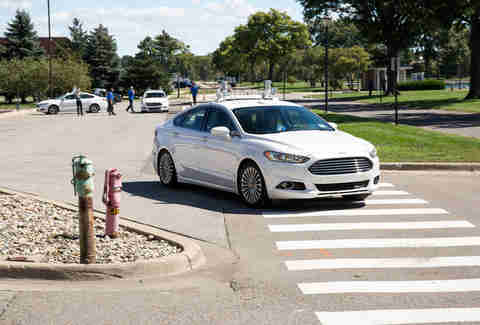 Ford expects to roll out a fleet of driverless cars to all its employees to use on its own Dearborn campus by 2018, where it can study the cars in a captive environment. 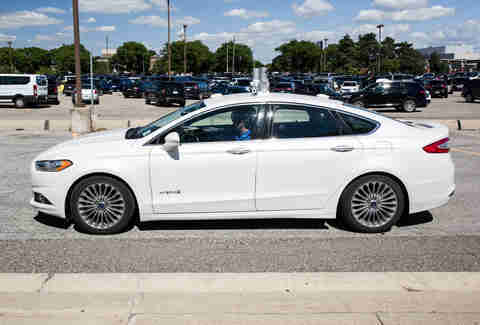 The company then expects to introduce a fully driverless car to the general public by 2021, and according to Ford CEO Mark Fields, it won't have the typical user interface of a traditional steering wheel or pedals. Is this the end of human-driven cars as we know them? Not likely. Company scion and chairman Bill Ford remarked that he "can't resist" using Drift Mode in the Focus RS -- a really, really good sign for those of us who prefer to do the driving ourselves. Jeff Jablansky is a contributor to Thrillist Cars, and somehow didn't make a single Yakov Smirnoff joke about cars driving you. See where his car takes him @unclewithcars.